This morning Jenny, Sarah and I drove to Columbus to go to the Skull Session at Ohio State. We were lucky to be attending today because we were able to see both the Ohio University Marching 110 and the Ohio State University Marching Band perform. 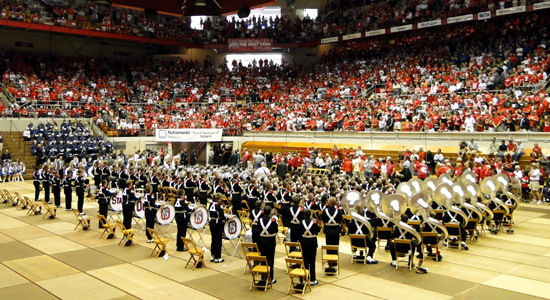 Skull Session is held prior to each OSU home game so that the band can have their final rehersal and focus completely on the music without having to think about the field formations. The skull Sessions are only free to the public and are held in St. John Arena. Today's game was between the Ohio State Buckeyes and the Ohio Bobcats. Each visiting band is invited to attend the Skull Session. Lucky for us, the O.U. Marching 110 decided to join the activities. We arrived at the arena about fifty minutes ahead of time. We found some front row seat at the corner of the floor. The Saint Ignatius High School Marching Band from Cleveland was performing for the crowd until the main event began. The Marching 110 made their impressive entrance with about twenty minutes to go. St. John Arena came to life as the Ohio State University Marching Band stormed into the court. The Buckeyes had a few warms for each of the different sections of the band and had some fun dancing and cheering at the same time. The Bobcats were given an opportunity to perform three numbers including Stand Up and Cheer and Long Train Running. Then it was time for Ohio State to get down to business. The band played all of their sounds for today's pre-game and halftime activities. The theme for today's halftime show was "That's All Folks!" It was a collection of songs from Saturday morning cartoons. After the Skull Session we walk around the area outside of the arena and towards Ohio Stadium. We got to see some more pre-game activities including a chance to the OSU cheerleaders and Brutus. It was a real treat for us all to hear both The Best Damn Band In The Land and The Most Exciting Band in the Land at the same time. On the way home we stopped in Reynoldsburg to eat at Five Guys Burgers and Fries. Yummy! The Ohio State Buckeyes went on to crush the Ohio University Bobcats 43-7. Click here to see all my pictures from the OSU Skull Session and pre-game activities.